The story of the Tower of Babel speaks of a time where the entire world was united under one language, before being split up again into a babbling mass of different warring cultures, dialects and diatribes. Could those linguistic limits be bested once more with a Tower of Tech? A few dedicated gadgets have appeared in recent times aiming to do just that, the real-world equivalents of the Star Trek universal translator (if a tad more limited in the amount of languages they can interpret). At this week's Pixel 2 phone launch, Google revealed its new Pixel Buds. At first glance, they appear just like a regular pair of in-ear Bluetooth earphones. But they come with one killer trick – near real-time, multi-lingual language translation. Paired with the Pixel 2 phone, all you have to do is push down on the right earbud, and ask the Pixel Buds to help you speak in a specific language. Say a phrase, pull your phone out, and its speaker will relay the message in your choice of one of 40 languages. Likewise, the person you're having a conversation with can respond, with their words then translated in the earbuds. Set to launch in November, if early demos are to be believed it's the closest we've yet come to breaking down the language barrier with gadgetry, offering a relatively seamless way to interact around the globe. But Google are far from the only company exploring the space where words and cultures collide. The ili from Japanese company Logbar is an alternative promising standalone device. 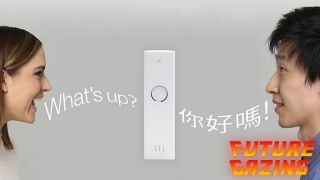 Described as a “Wi-Fi free instant translator for travellers”, the remote-shaped gadget has been in development for a few years, and went on sale this summer. It offers translation from one language to another in as little as 0.2 seconds and, crucially, has all of its processing magic and language data stored locally, so there’s no need for cash-hungry data roaming plans to be whacked while you’re travelling. The local storage brings with it some limitations – it necessitates five separate models to be made, each covering a separate translation element between English, Spanish, Chinese and Japanese. It seems universal translation will come at a price-per-language, with additional linguistic outputs coming at a sold-separately cost later down the line. Likewise, for the sake of accuracy, the ili focusses on travel-friendly phrases, and works best when used in short bursts. So if you’re planning on delivering that overseas business presentation to win over investors with, you may be out of luck. But, providing it’s as accurate in understanding short phrases as it claims to be, its simple one-button design looks like a great idea. There's no learning curve to master, and so long as it's juiced with power, you can be the same chatty person abroad as you are at home. The ili is joined by the Pilot earpiece and Panasonic’s multilingual translation device among the many dedicated gadgets looking to conquer that linguistic divide. That’s before you take in services like Skype, now dabbling in real-time translation, and the existing Google Translate tech, using both voice recognition and augmented reality image recognition to illuminate multi-lingual meanings for travellers. Non-verbal languages are also being opened up to those that can not understand them – through technology. Research at the National Taiwan University of Science and Technology has lead to the creation of a start-up called Yingmi Tech, working on a sign language-to-text translator. It’s essentially a sensor-laden pair of gloves that, originally designed to help interaction in VR worlds, have been repurposed to read sign-language gestures, connecting to a smartphone app to turn each sign into words. Its accuracy is strong enough to work with notoriously complex Chinese sign language, and it’s only an API-injection away from including audio translations, too. It's an exciting advancement in accessibility tech. Globally, its estimated that 70 million deaf people use sign language to communicate, but it's a much smaller number who understand the gestures without hearing problems. The onus should not be on those with the disability to accommodate those without, and a device like these gloves levels that playing field a little. To return to the Babel story, that community’s downfall was eventually its hubris, and a similar fate could befall those who become reliant on translation gadgets. When the great E-War finally starts, and that EMP bomb drops, you’d be better off having all that multi-lingual knowledge biologically stored in your noggin'. I recently returned from a trip to Japan, where the local language is a difficult one for westerners to pick up without many hours of study. My happiest memory? A night spent in a bar with locals that spoke (at best) broken English. It was heartening that, even without a common language, we all smiled, gestured and made good-natured but laughable attempts at communicating verbally. All that mattered was that there was a desire to understand and get to know each other. Would that experience have been enhanced or diminished through the use of a translating gadget? Were those verbal fumbles the humorous ice-breaker we all needed in order to find the common ground all humans share? Would a clearer understanding of each other have oiled those same wheels, or led to a robotic, transactional interaction? Either way, for those who struggle with languages, or need to interact with another language at short notice, these devices and services will open up a world of possibilities. We live in strange, tense times, one in which cross-cultural intolerance is running rife and global communities – while having the potential to be more connected than ever before – are increasingly being driven apart by mistrust and misunderstanding. Healing these rifts won’t be easy, but being able to have a chat, breaking down the walls of silence, will help. Gerald Lynch is TechRadar’s resident futurist. His bi-weekly Future Gazing column casts a critical eye over the technologies and trends that are set to shape our world, bringing back to today a glimpse of tomorrow in the boot of his Delorean. If you're planning on using this tech while you travel, be sure to also check out our list of the best travel apps.